This is the true wild carrot, more compact than Cow parsely and shorter and far less invasive than Hogweed. This lovely white 'umbellifer' (now Apiacea) often has a single red flower in the centre, said to be the origin of the folk name 'Queen Anne's Lace' because it was the blood from her pricked finger while she made the lace. The flowers are a great nectar source for mid-summer hoverflies, butterflies, ladybirds and bees. 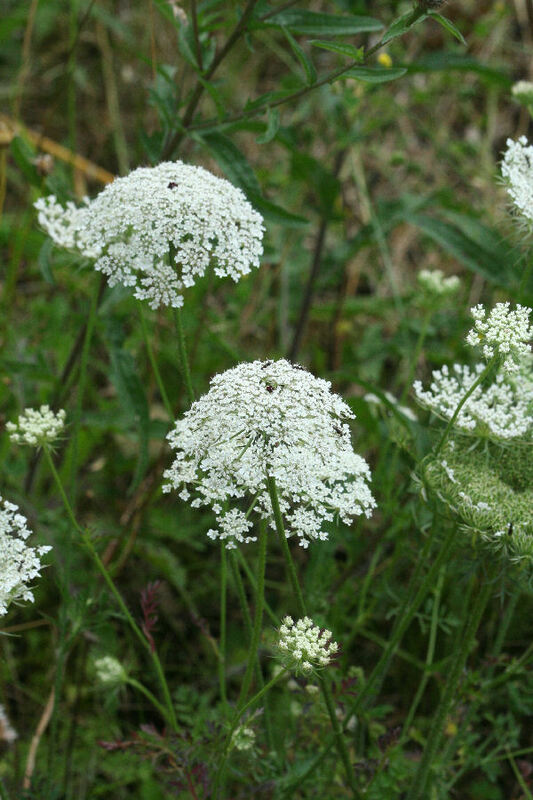 Growing this flower that flowers in mid to late summer as well as Cow Parsely that flowers in spring and Burnet Saxifrage that flowers in late summer and autumn you can get a even cover of delicate white lacy blooms throughout the season. The leaves are very finely divided; the botanical term is tri-pinnate. When a leaf is composed of a number of lateral leaflets, it is said to be pinnate or feather-like; and when these lateral divisions are themselves pinnated, it is said to be bi-pinnate, or twice-feathered. Although the roots smell of carrot when crushed, this is not the direct ancester of our vegetable carrot, which probably occured as a genetic mutation.Many healing properties are associated with this plant, but caution should be exercised as it also contains some powerful toxins and is closely related to very poisonous plants like Hemlock. strips of plug plants will be available in spring - you can pre-order here.